Philadelphia - The father of a Muslim American soldier killed in Iraq posed a question to Donald Trump: Have you read the Constitution? The address was the latest effort by Democrats to highlight their diversity and criticize Trump’s most contentious plans. Beyond his proposed wall across Mexico, the billionaire businessman has threatened to ban Muslims from entering the United States if he becomes president. “Look for the words ‘liberty’ and ‘equal protection of law,’” he said standing next to his wife, waving the paperback document vigorously. 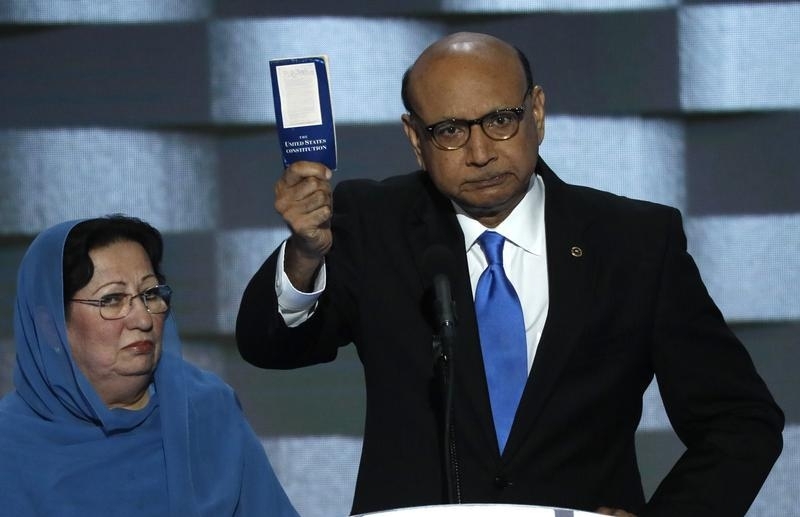 This is too funny…At the DNC, a Muslim holds up the constitution and asks if DT ever read it. The Muslim in the WH read it and threw it out, that’s where this dude got it! This Muslim is simply an opportunist. His son died in the line of duty, now need using it for Islam. Because a Hillary president is a win for the prophet himself. Sharia law is incompatible with the west. Enough said. Too bad this father isn't bothered by the fact Hillary was directly responsible for allowing 4 US servicemen to die in Benghazi! Hey relax Obama is a liberal but don't make up conspiracy theories like as if he disregarded the constitution. And come on he ain't a real muslim. 2) Just like lehvdil by yidden there are non observant and observant so too by muslims. The non observant are american and are fine. Its the observant ones that are an issue Thus when we say muslims are a problem we mean those that are true muslims , fast 40 days on ramadan, never drink wine, only eat hallal meat. The frie muslims like so say hey muslims don't hate america. Thank you thats because you are not religous. But islam hates the USA. 3) the constitution never outlaws immigration policies that are discriminatory rather only if you are a citizen does it not allow discrimination. 4) When the Constitution was written, noone was attacking us as viciously as today's muslims. The constitution was not written bnuvah. So we can always add an amendment that if we are attacked severely by a sect of people whom we can identify then we can discriminate. "Yishmaeli Chazir"? A man who lost a son who was defending our country? How many in the so-called "heimishe" community even know anyone who's serving in the military, let alone a son, daughter, or other close relative? The comments above, from the cretin who calls himself Mark Levin and from the other Yiddishe Klansmen, illustrate for the thousandth time what a cesspool of bigotry and ignorance the yeshivish oilam has become. The man and his wife have been living here peacefully and productively for more than 35 years, lost a son in the U.S. military, and the little cowards commenting above mock and denigrate them because of their religion?! The pain on their faces is evident even years after their son was killed. You know absolutely nothing about them, yet you prejudge them on their faith?! And then we have the nerve to shout about anti-Semitism if we even think someone is looking at us cross-eyed? How low can yeshivish and heimishe Jews go? Because I can just about guarantee that little if any of the vile racism and hate communicated by posters on frum websites comes from Modern Orthodox Jews. I for one am not A racist. I disagree with Trump on the Mexican comments. I think the overwhelming majorty are law abiding and hard workers. But muslims should be scrutinized. I agree with Trump whole heartedly. Your comparison to anti Semitism is very weak at best. Jews are not running around in the 21st century killing others in a massive vicious horrific manner as muslims are. To top it off many muslims cheer it on. Even if you will argue that terrorism is only a very small minority. However, there are two factors to consider when calculating risk. Frequency and severity. Muslim crimes are so severe that even if its frequency is equivalent to that of other sects, its severity outshines the frequency factor. Hence forth, we have no choice but to discriminate. What do you expect from someone who chose the name of a mental midget proud bigot like Mark Levin as his screen name? i disagree for every Muslim like this grieving father there arent to mishuganis there is a thousand. Two??? That's it??? I was thinking for like Ten or Twenty. Hey, do you think anyone's fooled by your liberal, frum bashing posts just because you keep changing your screen name ? Pathetic. Get a life buddy. Try looking in the mirror and telling yourself (and your other screen names) how smart you are cuz you're really not convincing anyone here. Exactly tight but the dems are running such a hugely flawed, dishonest and reviled candidate that their only hope is to deflect attention away from her and her crimes/lies/ "careless" behavior while sect of state, so they have to tell lies about Trump to try to convince people he's a racist which every smart thinking person knows he's not. Alabama isn't muslim? So the fact that his father and brother undeniably are, and he has done all he can while in office to side with the Muslims over Americans, and we are supposed to believe he's a devout Catholic, right? This father isn't too bright. Hillary also calls black lives matter thugs "the best of America." It's called pandering for votes.